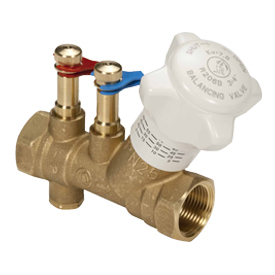 Static balancing valve with fixed orifice (Venturi principle). Brass body with female-female connections and 1/4"F connection for differential pressure controller capillary pipe. Available in version with or without probe holders to connect the differential pressure gauge for differential pressure measurement. Cast iron static balancing valve. With stainless steel disc, flanged connections and 1/4"F plug for differential pressure measure. Suitable for application with water -10÷120 °C, PN16. R206B flanged valves are available by checking the conditions of supply with our sales managers.